Have you ever wondered just how many lunch boxes you pack each and every year? It’s around 200 per child in school 5 days per week. Which means for me with both kids in school next year I will be packing a huge 400 lunch boxes per year! It’s exhausting just thinking about it. Fortunately, you don’t need to take out another mortgage just to pay for all of these lunches. We have some great tips on how to create healthy lunch boxes on a budget, that will not only save you money but also time. Because realistically, no parent has time to make elaborate lunches every morning before school. 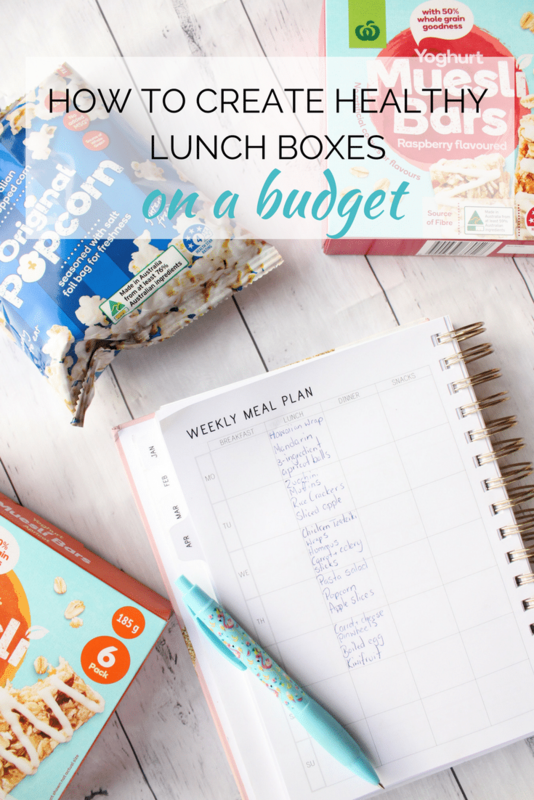 Planning the for the week ahead is essential if you want to keep your kids’ lunch boxes budget friendly. It means you can have all of the lunch box items on hand, and not spend time searching through the fridge and pantry each morning for lunch box fillers. Before you do the week’s grocery shopping, add a lunch section to your weekly meal plan (if you don’t meal plan, I highly recommend you give it a try). I use a planner with a weekly meal plan – even a scrap of paper will do. Once you have decided on the lunch menu, add any items you need to your shopping list. All you need to do when prepping each days lunch box is to refer to your meal plan. It might take you a few minutes to plan ahead of time, but it makes for effortless lunch box packing. Ever feel like it’s a struggle to pack a healthy, well balanced lunch box in addition to getting everyone ready and out of the house each morning. Taking a little time the night before to pack lunch boxes can be a game changer when it comes to busy school mornings. Once dinner is done each night, make a habit of spending a few minutes to make sandwiches or wraps, and assemble the lunch boxes. If you are adding any pantry food that might go soft in the fridge overnight, it’s easy enough to add those items in the morning. You can even get the kids involved. My kids love to choose what goes into their lunch boxes and help pack them. Chances are if they have helped pack the lunch boxes, they will be more likely to eat what’s inside them too! I like to make sure there are always at least a few lunch box fillers in the freezer at any one time. Things like pikelets, muesli bars, savoury and fruit muffins as well as pizza scrolls all freeze well. I tend to just make one recipe every few days when the urge strikes and pop it straight in the freezer, but holding a bulk baking morning or afternoon is a great way to fill the freezer in one go. Choose a few recipes, check the pantry and hit the supermarket to gather all of the ingredients, and get baking! Getting together with a few other mums is a great way to make the bulk baking session fun, and you can divide up all of your freshly baked goodies at the end of the day. Another great way to save time in the morning is to freeze sandwiches in bulk. All you then have to do is take a sandwich out of the freezer, pop it in the lunch box and it will be defrosted and ready to eat by lunch time. Just be sure to choose fillings that will freeze well and steer clear of those that won’t. Things like lettuce will not be so nice after being frozen, but most spreads, meats and cheese freeze fantastically. Before hitting Woolworths I always check the weekly catalogue to check for any great specials on lunch box items, especially those half price bargains! I always stock up on any on sale items that I regularly use, trying to buy enough to get me through until the items are half price once again. It’s a great way to drastically cut down your grocery bill. No matter how much I try to keep a supply of home made lunch box fillers in the freezer, there are always times when I just don’t have time to bake. I keep a stash of lunch box fillers in the pantry for that exact reason, and it has saved me on more than one occasion. 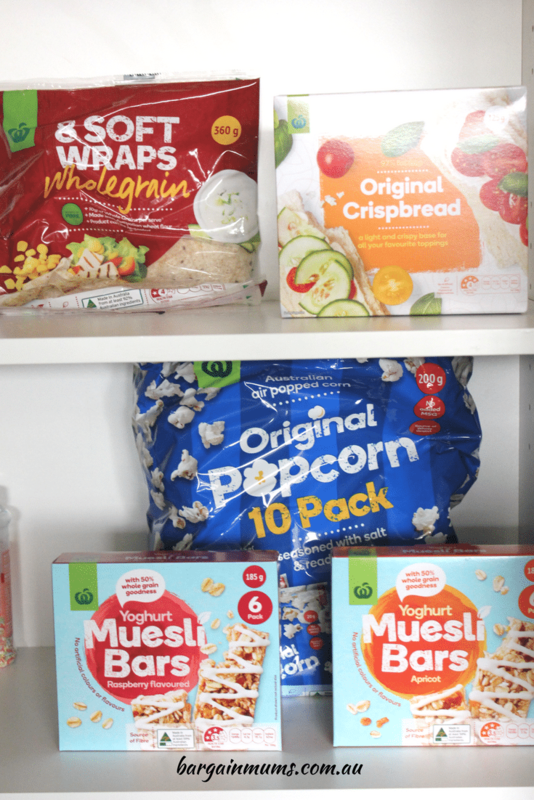 Basic lunch box items like muesli bars, individual packets of popcorn and even multigrain wraps are perfect to always have on hand. My snack supply also comes in handy on weekends when we are heading out for the day. I put a few bits and pieces in my bag before we head out which saves having to buy expensive snacks when we are out and about. This is a little known secret, but a great place to find healthy lunch box snacks that kids will actually eat is the health food isle. The Macro range available only at Woolworths has some fantastic products, like Macro Kids Air Puffed Fava Beans and Macro Oven Baked Quinoa Puffs.